The Adventures of Big Apple Angie: 1st Runner Up - What, What! 1st Runner Up - What, What! 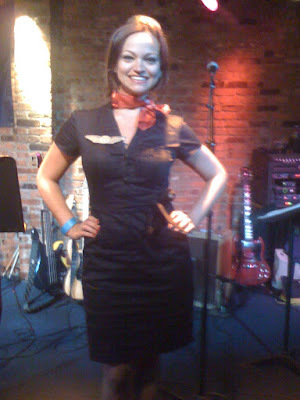 From here on out, Eddie Money's Take Me Home Tonight will remind me of my one magical evening as an Agency Idol... the band was awesome, the performers went all out, the show was hilarious, my colleagues were so supportive (like a bra!) and all-in-all, it was one of my favorite days as a Weber Shandwick employee. Lovethisplace. I am pretty sure video (and audio, oye) footage would only serve to ruin my life, but we'll see about putting up a few snippets here and there. Maybe. I should have more pictures to share in the coming days, so stay tuned! congrats! all that karaoking did you good!